Please join us on Tuesday, April 16th at the Holiday Inn Express, 3990 Tampa Rd, Oldsmar from 7-9 pm and meet our special guest Dan Foard. Dan is the President of Videophotog Productions Aerial Video Drone Services. He says “Evolving with the ever-changing television broadcast environment our company has elevated to the skies with 4K cinematography and infrared photography for Fire, Law enforcement and municipal services”. 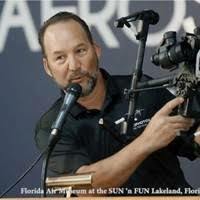 Fully licensed and certified by the FAA his team puts safety first. They offer full production services and Crewing for Live event or Post production with Editing facilities. Dan is also a Camera OP/DP and has worked on such shows as Wild & Keszey (Swamp Brothers) TV show for Discovery Channel 2013-2014, HDRA Desert Racing Series, H1Unlimited Hydroplane Racing Series World Tour 2002-Present, multiple “Made for TV” Music videos & Documentaries. Ironman Cozumel, Los Cabos, Royal Caribbean Cruise Line Corporate Video, VocalizeU Launch Party in Hollywood CA & Artist intensive event including Jordan Sparks and Natasha Bedingfield. American Hero Experience TV Show for NBC Sports and hand-held Camera Operator for College Football & Pro Volleyball for AVP.